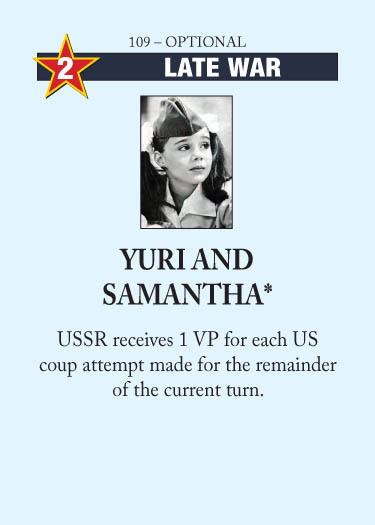 This entry was posted in Late War, USSR Events and tagged Yuri and Samantha. Bookmark the permalink. Maybe you can add the rules conflict that occurs if USSR is on -19 and plays CIA created at DEFCON 2. If USA coups a battleground, USSR gets -20 VP, but also defcon 1. I think the official decision was that US wins on DEFCON before USSR wins on autovictory? Correction: Andropov was actually one of the architects of the crushing of the Hungarian Revolution in 1956.